The Scottish Conservative and Unionist Party has selected Andrew Bowie as its candidate for Aberdeenshire West and Kincardine in the general election. The party is aiming to increase its share of the vote and number of seats at Westminster on June 8, with Aberdeenshire West and Kincardine among several target constituencies. At last year’s Holyrood election, the Scottish Conservatives defeated the SNP to win the similar Aberdeenshire West constituency with a 17% increase in vote share and a swing of 12%. Mr Bowie, a former officer in the Royal Navy, currently works at the Scottish Parliament as head of office for Liam Kerr MSP and who has also served as a rural affairs advisor and parliamentary assistant to Ian Duncan MEP in Brussels,. He was approved unanimously at a meeting of the local party in Westhill. The 29-year-old was educated at Inverurie Academy, Britannia Royal Naval College and the University of Aberdeen. Mr Bowie said: “I am delighted to have been selected to stand in West Aberdeenshire and Kincardine. “This area decisively rejected independence in 2014 and I will be appealing to Unionist voters to send the SNP a strong message that we do not want another referendum. “Recent polls make it clear that only the Scottish Conservatives can stand up to the SNP in constituencies across Scotland – particularly here in Aberdeenshire. Scottish Conservative MSP for Aberdeenshire West, Alexander Burnett, said: “I am delighted to support Andrew as candidate for West Aberdeenshire and Kincardine. People in this area need a strong representative who is not obsessed with breaking up the UK. Last month Prime Minister Theresa May announced a snap general election which will take place on June 8. 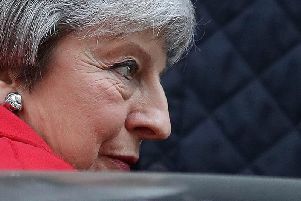 Justifying the decision, Mrs May said: “The country is coming together but Westminster is not.